I know, I know, I have reviewed Rubio's a bunch of times already. But Rubio's is one of the only casual dining establishments within a mile or so of my house that is open on weekends, at a good price point, and actually tastes good. Besides high end dining, my only other choices are McDonald's or Panera. When I want something simple, fast, and tasty, I go to Rubio's. I won't claim it is the best Mexican place in the city. I won't say it is authentic. But, it is reliable. And, they regularly add items to the menu, so there are frequently new things for me to try out, like the chimichuri that was added last May. I like that they are willing to experiment with new items, although the chimichuri is no longer on the menu, so I guess I was not alone in my dislike for it. There are also seasonal offerings, like the langostino lobster, available only during a short period in early winter, as a burrito, or a taco. Thus, I keep returning. This time, it was for another new menu option, enchiladas. Not something I'd normally order, but I was invited in for a free tasting, so I decided to give it a go. Shrimp Enchilada with Verde Sauce. There was only one seafood option available: shrimp. Since I'm a seafood girl, I went for it, described as "sustainable, pan-seared shrimp, a blend of three melted cheeses and cilantro/onion wrapped in toasted corn tortillas. 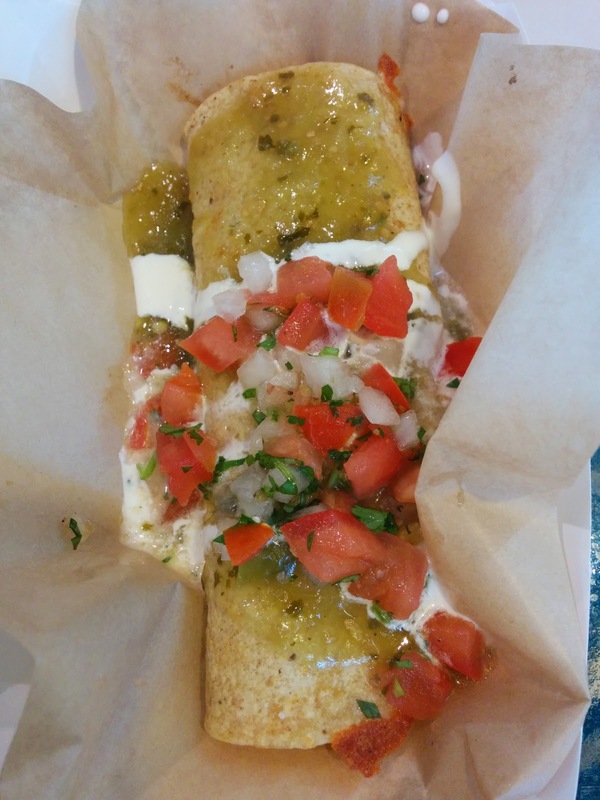 Topped with verde enchilada sauce, salsa fresca and a drizzle of white sauce." It sounded a lot like the enchilada version of the salsa verde shrimp taco, which I've had twice before, made from the same shrimp, cheeses, and cilantro/onion mix, although the taco has the zestier creamy chipotle sauce rather than the simple white sauce, cabbage instead of salsa fresca, and added avocado. I really wasn't sure how Rubio's would do enchiladas. Not that I'm an expert, but I thought they are usually baked, not exactly the format for a fast-casual restaurant. And indeed, these didn't seem baked. I'm also used to enchiladas smothered in sauce, and topped with melted cheese. While the Rubio's version was topped with sauce, it certainly wasn't smothered in it, and while it had cheese inside, there was none melted on top. So, just based on looks, this didn't quite seem like an enchilada to me. It was rolled like an enchilada however, in a corn tortilla. I'm not sure if these are the exact same tortillas they use for the tacos, but it seemed like it, although, are the taco tortillas really this big? The tortilla was moist and unremarkable. Inside was the shrimp and cheese. I remember when I had the salsa verde shrimp tacos, I never really tasted the cheese. That was not the case here. All I could taste was cheese. There was tons of it, and it completely overpowered the shrimp. And, unfortunately for me, I'm pretty sure the three cheese blend contained jack, my absolute least favorite cheese. I really didn't like the cheese. So I pulled out the shrimp. Like all Rubio's shrimp preparations, they are "marinated in ancho chiles, garlic, cilantro and a touch of olive oil and pan-seared on an authentic comal." And like always, I was impressed by the shrimp. They somehow never come out rubbery or fishy, and the marinate really imparts a lot of flavor. But, inside the enchilada with all that cheese, you certainly couldn't taste the shrimp. The description said there was also cilantro/onion inside, which I never found. There are two areas that Rubio's always impresses me with: the quality and execution of the seafood, and, the flavorful sauces. As usual, I was looking forward to the sauces. On top was the verde enchilada sauce, which unfortunately reminded me of the tomatillo salsa from the salsa bar, flavorless, far too mild, and watery. It offered nothing to the enchilada, and I had to add Roasted Chipotle Salsa from the salsa bar to give the enchilada any kick. I'm not sure why they use the verde sauce here, rather than the traditional enchilada sauce used on the others. I'm sure I could ask for it that way instead, if I wanted an enchilada again. There was also the white sauce, which I appreciated for the creamy factor as always, but, given how mild the other flavors were, I would have preferred the creamy chipotle sauce, like they use for the tacos, which again, I'm sure I could ask for instead. And finally, the salsa fresca, "made fresh daily and features diced Roma tomatoes, diced white onions, freshly chopped cilantro, jalapeño and Serrano chiles, lime zest, oregano and a pinch of salt." The salsa fresca was fresh and flavorful, and as always, I was impressed by the quality of the tomatoes. I appreciated having the chunky and fresh component to the enchilada, although, I wouldn't normally put this on my enchilada. So, as you can tell, it was not a winner for me, and I don't think it is just because I don't normally order enchiladas. While I liked the shrimp, there was little else here that was successful: too much cheese overwhelmed the entire thing, the sauces were not flavorful enough, and, it really wasn't a traditional enchilada. I wouldn't get one again. Grilled Steak Enchilada with Fire Roasted Sauce. The non-seafood enchilada choices are chicken, steak, or plain cheese. Ojan's picked the steak, "made with grilled steak, a blend of three melted cheeses and cilantro/onion wrapped in toasted corn tortillas. 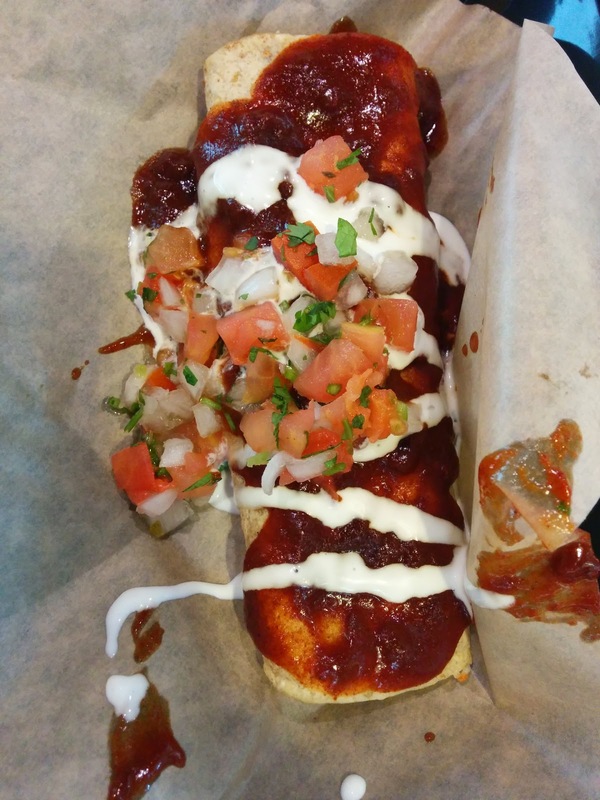 Topped with fire-roasted enchilada sauce, salsa fresca and a drizzle of white sauce." So, basically the same as my shrimp version, except using the same grilled steak that they use for burritos and tacos, and topped with a more classic enchilada sauce instead of verde sauce. I did not taste the steak, but it is advertised as "marinated with garlic, savory spices and cilantro and grilled over an open flame", and Ojan said it was better than he expected, and, better than the steak we have in our cafe at our office. I did try the "fire-roasted enchilada sauce". While I didn't really grasp the fire-roasted nature of it, it seemed like traditional enchilada sauce, and I greatly preferred it to my verde sauce. If I were to order another enchilada, I'd get this sauce. This was far more of a classic enchilada, but it was still not baked, and although the sauce was more standard, it was not smothered like I'm accustomed to. Not something I'd order again. During my few month stay in Syndey, I tried a huge assortment of their chocolates. Unfortunately, I lost most of the notes I took during that time. This is just a smattering of what I could find. None were particularly good, but it was novel to try out another country's common chocolates. "Whipped nougat and caramel centre, covered in chocolate." 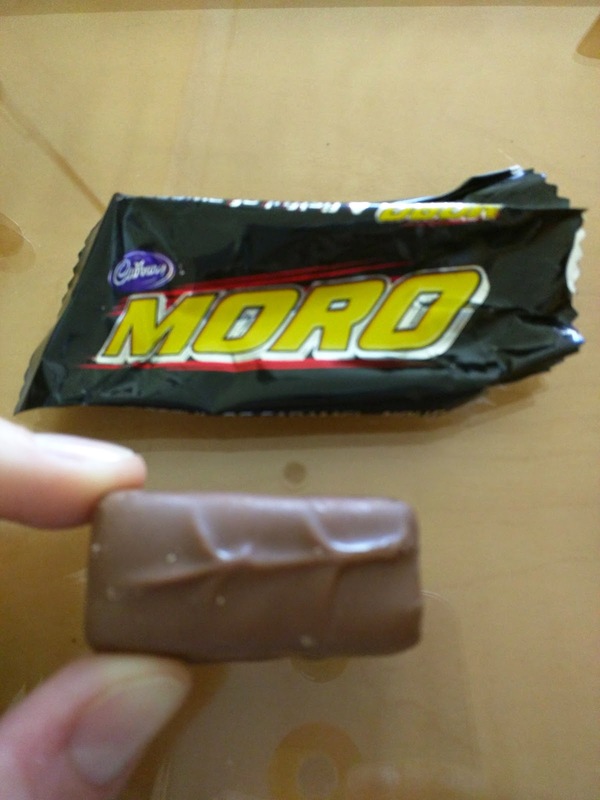 Apparently Cadbury makes a bunch of different bars and calls them all the Moro. What you get depends on which country you buy it in. I got mine as part of the Cadbury Favorites mix in Australia. I didn’t pick up on the nougat. The caramel was a hard variety. The chocolate coating was low quality and uninteresting. Meh. Update: just thick chocolately caramel, I don’t really like this at all. "A golden honeycombed centre surrounded by delicious Cadbury milk chocolate". Another classic, around since 1929. 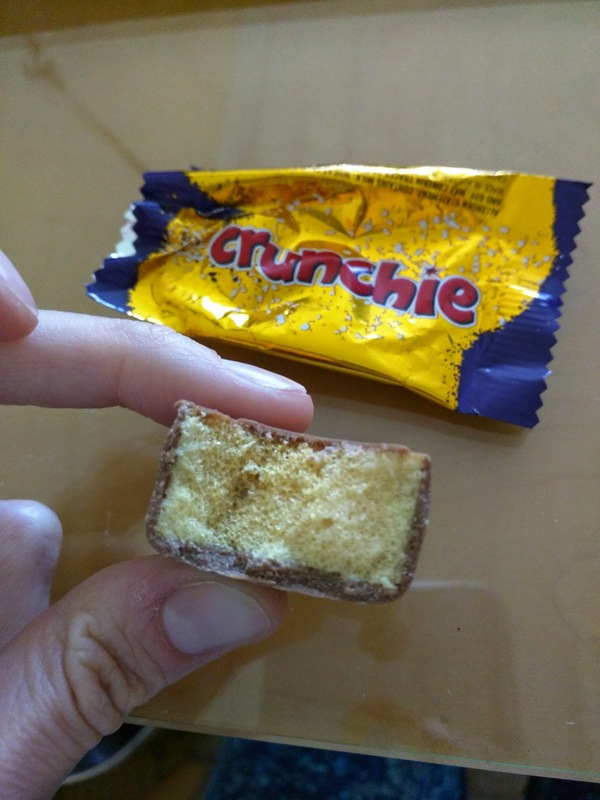 The honeycomb was sweet, with a good crunch. The milk chocolate on the outside was standard, smooth Cadbury, that just isn’t my style. I would have preferred just to have the honeycomb. Update: Very sweet filling that is crunchy, but … not complex, just sweet. Boost: "A smooth textured chocolate flavoured centre with crunchy biscuit pieces surrounded in flowing caramel, all covered in Cadbury’s world famous Cadbury Dairy Milk® milk chocolate". Tasting notes: Probably the best one I've had yet, but not particularly memorable, caramel and biscuit covered in chocolate. Something in the biscuit was a bit stale tasting. Cherry Ripe: "Ripe juicy cherries and moist coconut smothered in rich Old Gold® dark chocolate". Tasting notes: This is apparently Australia's oldest chocolate bar. It sounded great to me, who doesn't love coconut, cherry, and dark chocolate? Yum! Flake: "Delicate strands of crumbly, Cadbury Dairy Milk® milk chocolate". Tasting notes: Just milk chocolate, nothing special. Not as flaky as I expected. Fudge: "Bar of soft fudge covered in delicious Cadbury milk chocolate." Tasting notes: This is a UK product. Gross milk chocolate outside, I have no idea what the filling was. Not good. 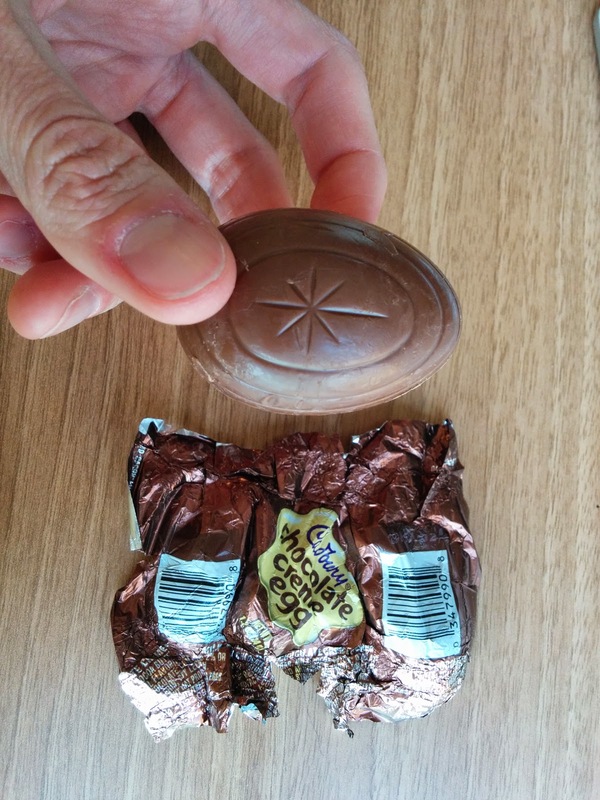 From the outside, the chocolate creme egg looks just like a regular Cadbury creme egg. The shell is made from standard Cadbury milk chocolate, smooth and creamy, but unremarkable. 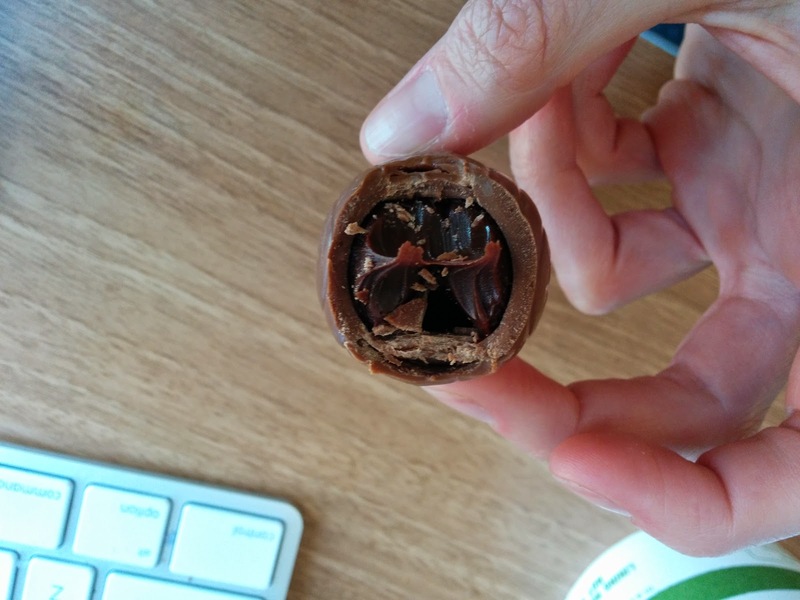 But ... inside is nothing like a classic creme egg. Besides having no creamy white part, there is also no ‘yolk’. The inside is just pure chocolate fudge. They call it chocolate creme, but it wasn’t really creamy, it was thick like a chocolate caramel. The only similarity to the traditional creme egg is that this too was cloyingly sweet. I'm not sure how they made chocolate that sweet, but, ugh, I couldn't finish this. At least with the regular egg it has the novelty of looking like an egg, whereas this one was just sweet overload, with no fun factor.